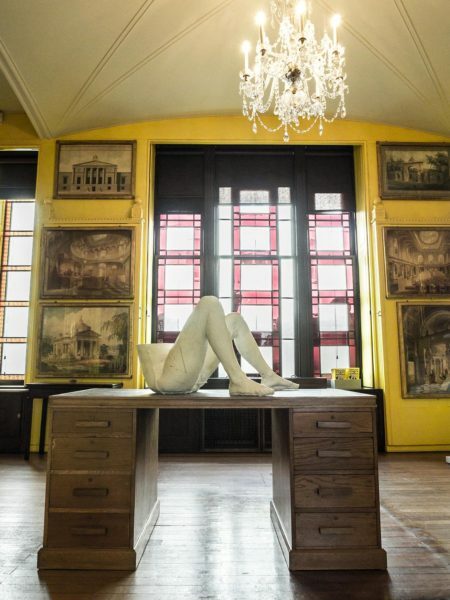 There is still a week in which to catch Sarah Lucas’ exhibition at the Sir John Soane’s Museum, and it is well worth the detour, whether you saw her British Pavilion in Venice last year, or not. 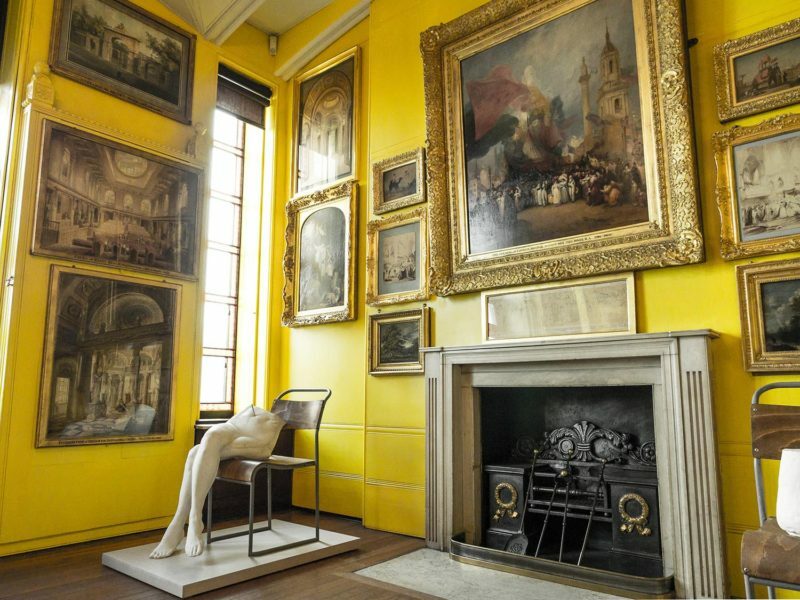 For the Sir John Soane’s Museum, and in fact one room of it in particular, the North Drawing Room, was quite specifically an inspiration for her approach to the Venice exhibition. 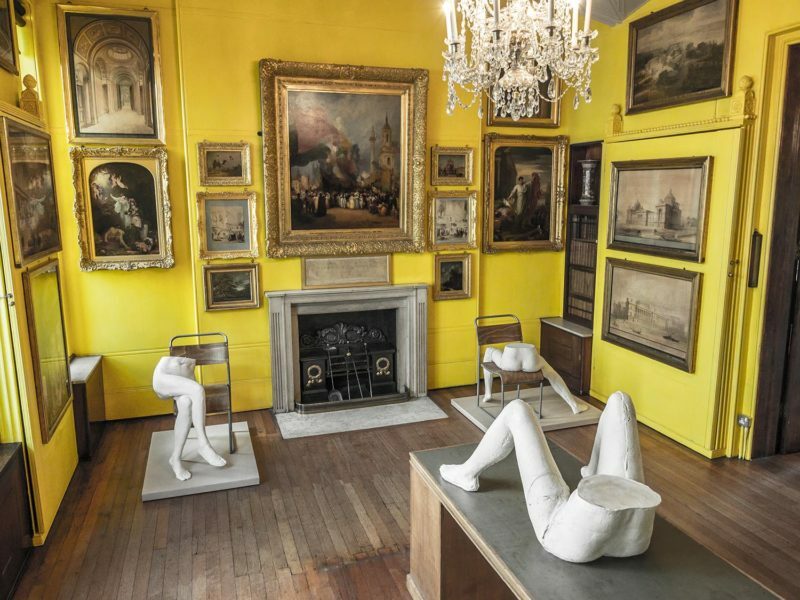 So there is a pleasing circularity in now bringing three of the works from the Biennale back to London, and placing them directly within the dense collections and overwhelming aesthetic of the museum in Lincoln’s Inn Fields. The rich and slightly lustrous yellow walls of the North Drawing Room inspired Lucas to use this colour on the walls throughout the British Pavilion last year. Eggs have featured in Lucas’ work since the early 90s, and custard was the suitably eggy reference point here, the colour acting as a pivot between Soane’s undoubtedly Italianate model and Lucas’ culinary one. 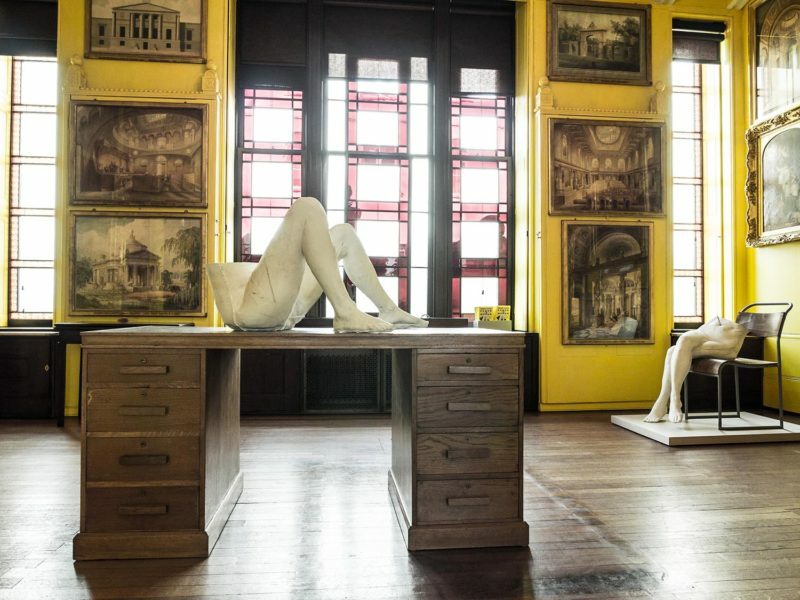 Lucas has commented on the correspondances between the Museum and the neo-classical architecture of the British Pavilion, and the Museum is famously full of plaster casts of classical sculpture and architectural fragments, so Lucas’ casts of truncated female bodies find immediate resonance here. 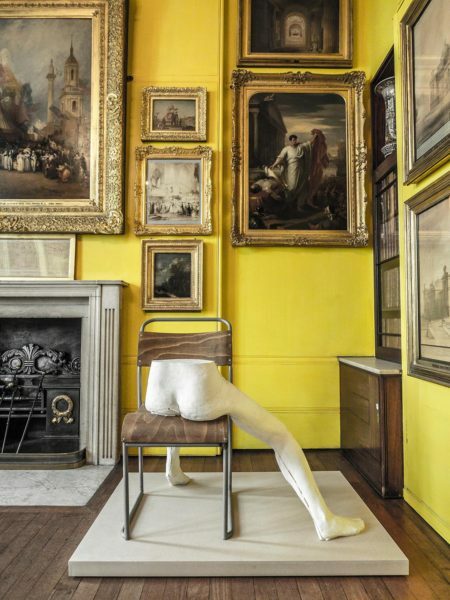 There is a long history of contemporary interventions in historical collections – Hans Ulrich Obrist’s 1999 exhibition at the Sir John Soane’s Museum, Remember Tomorrow, being one of the early and notable examples. Since then the device has become so familiar that it is worth asking again: how do contemporary works operate within historical contexts? Obviously, the answer is different for each artist and each context, but one can usefully ask whether the intervention represents an homage, or a critique of the context; whether the contemporary work points to continuities of concern or radical disjunctures, that in turn produce new understandings of both the historical and the contemporary. Sarah Lucas’ Muses, three waist-down casts of female nudes differ from other female figures in the museum in that they are specific individuals and named as such, rather than allegorical or mythological, or simply anonymous figures. YOKO, PAULINE and MICHELE arrange their legs in poses that unmistakably speak of the modern woman: even ignoring the insertion of cigarettes in orifices, they are graceful, but hardly demure. The casting method is purposefully rough, legs have seams running the length of them and nothing looks sanded-down or smoothed off. This gives each figure a tough immediacy, as well as perhaps recalling the pragmatic fieldwork of the archeologist. Other continuities that spring to mind would be August Rodin’s female figures – specifically Iris – Messenger of the Gods, c.1895, in relation to Lucas’ MICHELE, with her splayed legs. But that resemblance is superficial only, since we are talking here about a woman artist depicting the female body. The relationship of artist to model could not be more different. So perhaps Carolee Schneeman’s 1975 performance Interior Scroll would be a more pertinent comparator to consider. Lucas did use her own body for some of the casts in the series. What is certain is that the works operate differently here than they did in Venice – away from the art world circus and the political themes of the Biennale, they are perhaps quieter, but more complex, more anchored in their central concerns. And that is why you should get along to take a look.